It was this day in 2011 that we received the news that Sarah had a form of Cerebral Palsy. I can remember leaving the pediatrician's office in a state of shock and disbelief. His informing me that is was probably an oxygen deficiency in the early months of pregnancy assuring words of "you didn't do anything wrong" or "this wasn't preventable" weren't exactly comforting at the time. The past two years have been nothing short of wonderful with Sarah. Her progress in speech has probably been the biggest change and little by little, her development is growing. At her own pace. This does mean though, that the gap between her and her peers is getting larger. It wasn't so big a few years ago but I notice it more now. For the most part, I've come to a point of acceptance of the diagnosis but I still have moments of grief and sadness. I'm sad for what she is missing, although she lives just in her moment. I'm sad for what could be or could have been. But when the day is over, she is the best therapy in the world. I came back from a movie with Andrea this afternoon and when Sarah noticed me, I saw the delight in her eyes, felt her tiny arms around my neck and melted when I heard her say "Mommy! You came back!" It is good to be missed and I am so blessed. Miss that sweet little girl and her whole family! What a sweet welcome home! what a beautiful post. I remember coming back home tired and seeing such bright eyes of my daughter, full of love and light, even when she couldn't talk or say anything. Our kids have this great power of showing their love without saying a word. they are truly a miracle. thanks for joining me and it's great to come here. Wow. Such a sweet post. My heart goes out to you. 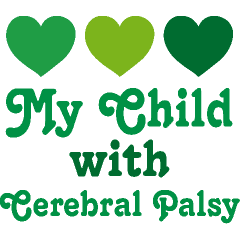 My 17yo daughter has cerebral palsy as well. I don't have a day to mark like you do. No one ever spoke those words. I just began to assume she had CP. By the time I had basically come to terms with it, I saw it on a doctor's form when I was checking out, right there under a diagnostic code. Very anti-climactic. I pray the years with your daughter help you move beyond the diagnosis on this day to just another beautiful day with her. I wish I could say the grieving eventually ends, but I don't think it ever does.